Michael Hanley, CEO, Lakeland Dairies, Niall Callanan, Easyfix Ltd, Lakeland Supreme Milk Quality Winner Ambrose, Margaret and Gavin Daly, Professor Paddy Wall, and Padraig Young, Chairman, Lakeland Dairies. Coming up with new and innovative foods is very important, but ensuring that all of the required traceability procedures and processes are in place is an even greater priority for the dairy sector and the food industry generally, according to Professor Paddy Wall. He was speaking at the Lakeland Dairies Milk Quality Awards, where dairy farmers from both sides of the border won top honours for milk produced on their farms. 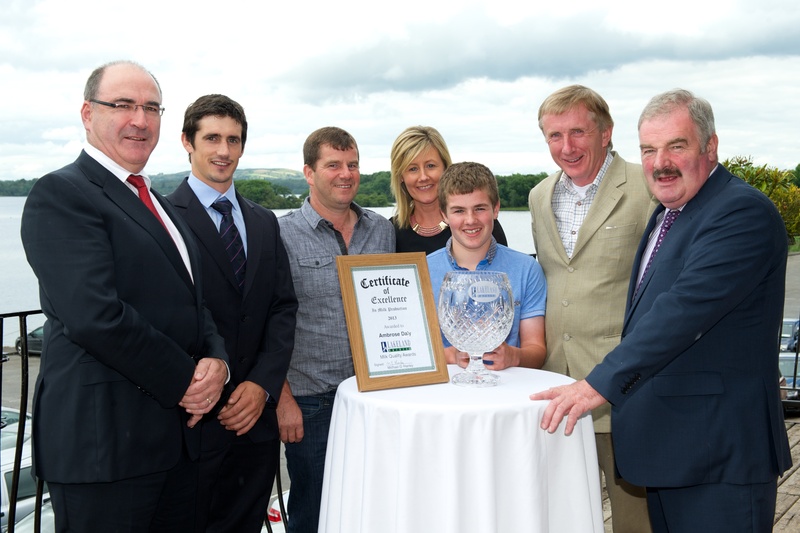 • Ambrose Daly, Mullagh, Kells, Co. Meath won the Lakeland Dairies Supreme Milk Quality Award and also won the 0 – 400,000 litres milk production category. The runner-up in this category was Sean Coyle, Kilnaleck, Co Cavan. • Abbey and Damien McManus of Gurteen, Garadice Co Leitrim won the 400,000+ litres milk production category, closely followed by runners-up Nigel and Alan Cowan Shannow, Ballinagh, Co Cavan. • In the category for New Entrants to Dairy Farming, Noel Kennedy of Collinstown, Co. Westmeath won this award for exceptional milk quality. • The overall Northern Ireland Milk Quality Award Winner is Billy Campbell, Gortin, Omagh, Co Tyrone. The Northern Ireland runner-up is Peter McConville, Rathfriland, Newry, Co Down. Congratulating the winners, Professor Wall said: “With a growing global population, farmers will be expected to produce more food, more sustainably and at a price which consumers can afford. Consumers are also increasingly health conscious and this extends to their perceptions of food and the companies and countries who are producing their food.